This article is about Plymouth, England. For other uses, see Plymouth (disambiguation). 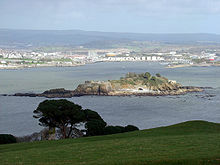 Plymouth is a city in Devon, South West England. It is on the south coast. It has a large port at Devonport used by the Royal Navy. Nearly 250,000 people live in Plymouth and it is the largest place in Devon. West of Plymouth is the mouth of the River Tamar which is called the Hamoaze. Plymouth means mouth of the River Plym. The Roman Catholic Bishop of Plymouth has his cathedral here. Plymouth was badly affected by German bombing during the Second World War, when many buildings were destroyed. The Plymouth Fathers and the Plymouth Brethren were both named after Plymouth. Plymouth is linked to Saltash in Cornwall by two bridges across the River Tamar: the Royal Albert Bridge (built in 1859) carries the railway line to Penzance and the Tamar Bridge the A38 main road. On Plymouth Hoe is the third lighthouse which formerly stood on the Eddystone Rock in the English Channel. It has a football team called Plymouth Argyle and a rugby football team called Plymouth Albion. This page was last changed on 9 March 2015, at 13:56.